DTT: A survivor has told the story of how more foreign tourists would have died if it wasn’t for the brave Muslims Tunisians forming a human-shield, trying to protect the tourists. 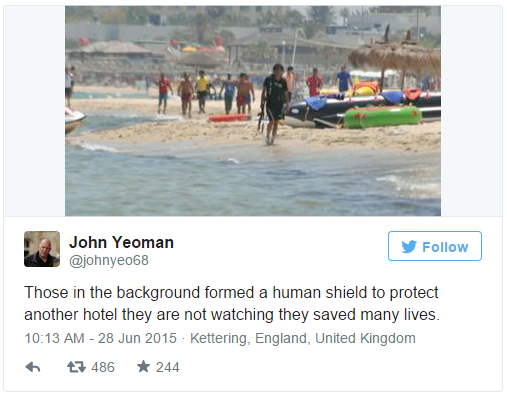 The survivor, John Yeoman, who was in a pool when he heard the gunfire, said the men in the background of the picture (below) taken during the shooting were not stood there watching but, were forming human-shield protecting the foreign tourists from getting killed. It is pity that not all news teams are covering this, what happened was terrible but, these locals acted as heroes, no doubt saving many lives, of-course this doesn’t fuel the fear-mongering. This shows that the majority of the locals are not extremists terrorists as the media would like you to believe, but compassionate human beings doesn’t fit the profile main stream media is trying to push. ISIS are monsters, barbarians and don’t represent Muslims or the Islamic faith. If you want to see the true essence of Islam then look at the local Muslims forming human-shield to protect innocent lives being taken from evil twisted individuals. 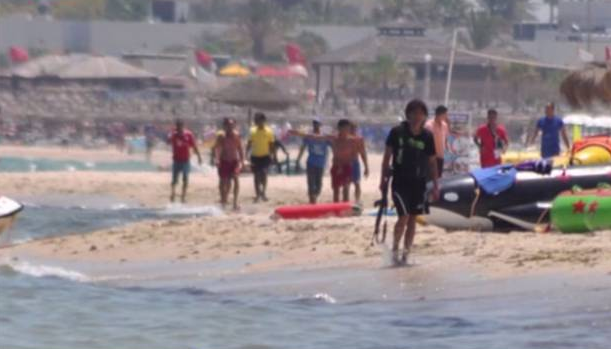 A British survivor of the Tunisian hotel massacre says brave Tunisians formed a human shield to protect Western tourists. John Yeoman, who was in the hotel next to the one targeted by the gunman, said the men in the background of a picture taken during the shooting were not stood watching the gunman – but trying to save people. The 46 year-old transport worker from Kettering described how the staff at the Bellevue hotel lined up to prevent killer gunman Seifeddine Rezgui from going into the hotel after he opened fire.